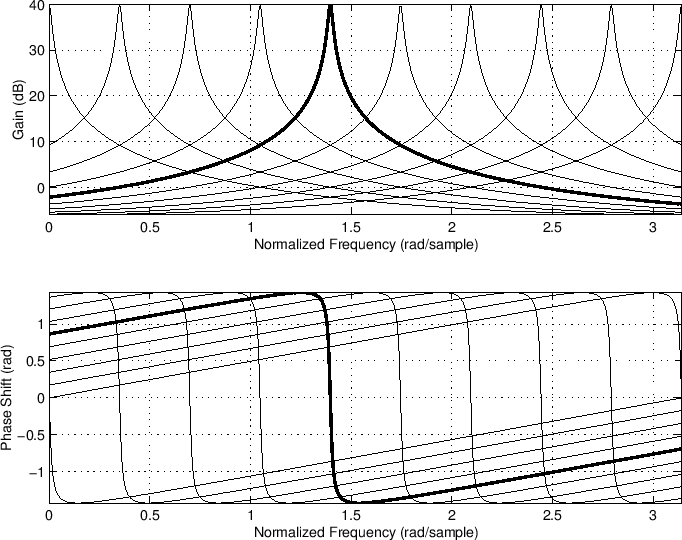 It is quite common to want to vary the resonance frequency of a resonator in real time. This is a special case of a tunable filter. In the pre-digital days of analog synthesizers, filter modules were tuned by means of control voltages, and were thus called voltage-controlled filters (VCF). 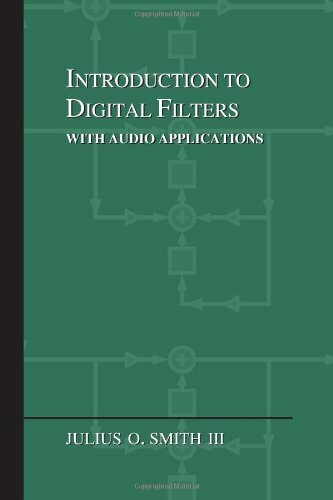 In the digital domain, control voltages are replaced by time-varying filter coefficients. 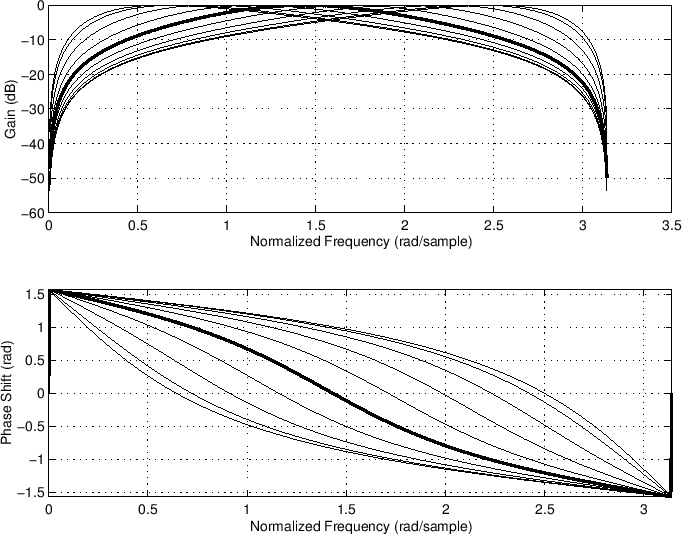 In the time-varying case, the choice of filter structure has a profound effect on how the filter characteristics vary with respect to coefficient variations. 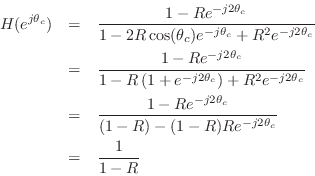 In this section, we will take a look at the time-varying two-pole resonator. and, since is real and positive, it coincides with the amplitude response, i.e., . We did not show that resonance gain is maximized at and minimized at , but this is straightforward to show, and strongly suggested by Fig.B.17 (and Fig.B.9). 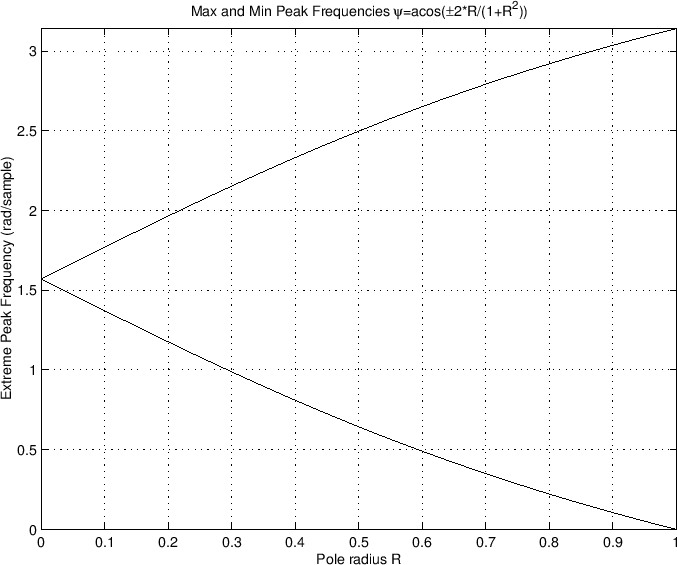 Note that the ratio of the dc resonance gain to the resonance gain is unbounded! The sharper the resonance (the closer is to 1), the greater the disparity in the gain. 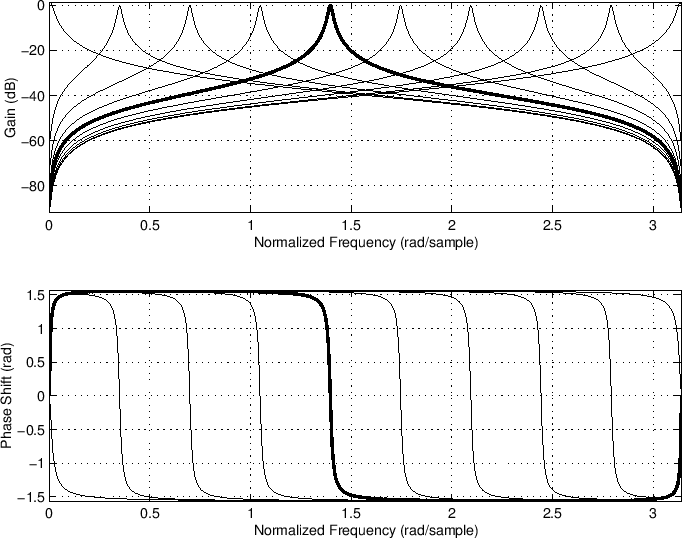 Figure B.17 illustrates a number of resonator frequency responses for the case . (Resonators in practice may use values of even closer to 1 than this--even the case is used for making recursive digital sinusoidal oscillators .) 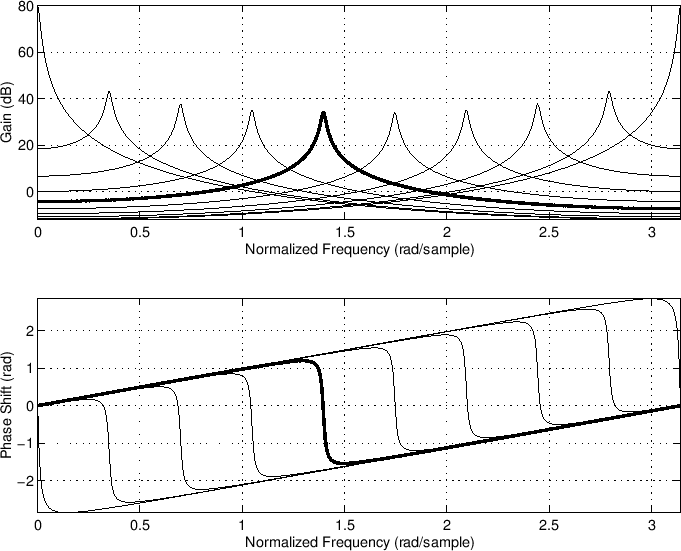 For resonator tunings at dc and , we predict the resonance gain to be dB, and this is what we see in the plot. When the resonance is tuned to , the gain drops well below 40 dB. Clearly, we will need to compensate this gain variation when trying to use the two-pole digital resonator as a tunable filter. 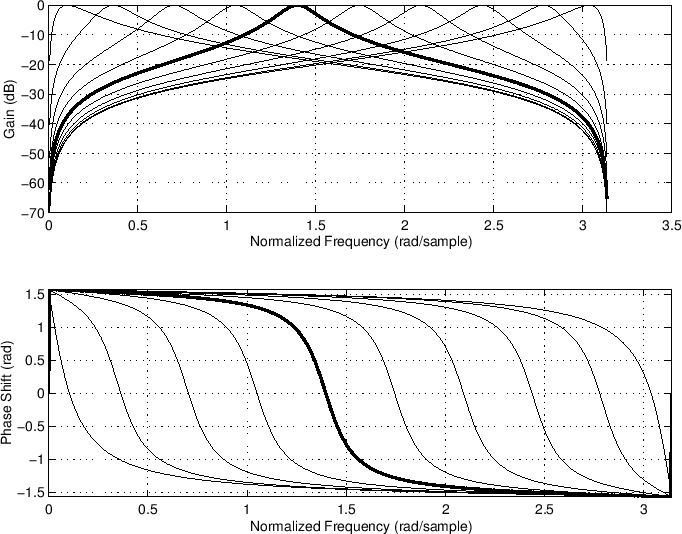 Figure B.17: Frequency response overlays for the two-pole resonator , for and 10 values of uniformly spaced from 0 to . The 5th case is plotted using thicker lines. Figure B.18 shows the same type of plot for the complex one-pole resonator , for and 10 values of . 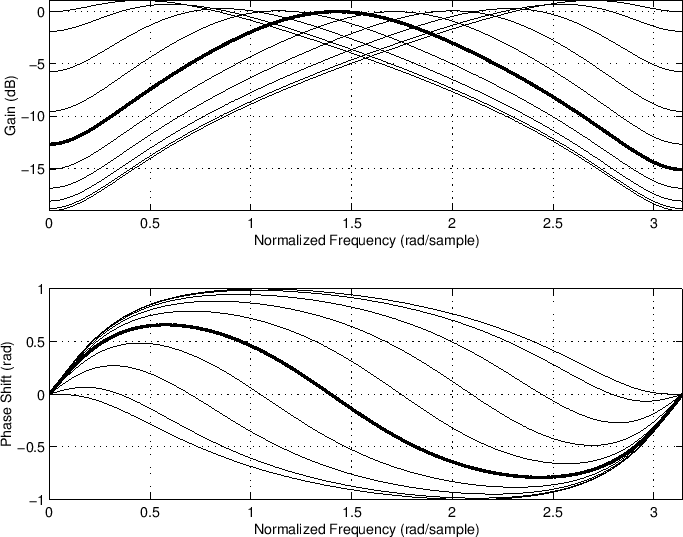 In this case, we expect the frequency response evaluated at the center frequency to be . Thus, the gain at resonance for the plotted example is db for all tunings. Furthermore, for the complex resonator, the resonance gain is also exactly equal to the peak gain. 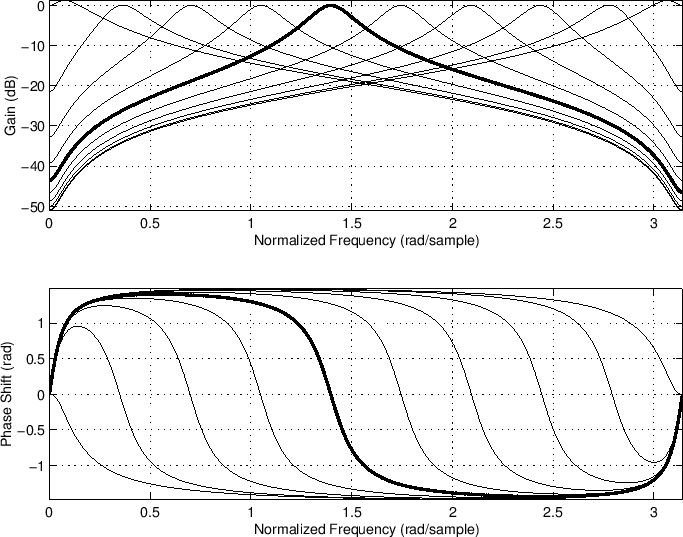 Figure B.18: Frequency response overlays for the one-pole complex resonator , for and 10 values of uniformly spaced from 0 to . The 5th case is plotted using thicker lines. which is better behaved, but now the response falls to zero at dc and rather than being heavily boosted, as we found in Eq. (B.12). As a practical note, it is worth mentioning that in popular analog synthesizers (both real and virtualB.7), VCFs are typically fourth order rather than second order as we have studied here. Perhaps the best known VCF is the Moog VCF. The four-pole Moog VCF is configured to be a lowpass filter with an optional resonance near the cut-off frequency. When the resonance is strong, it functions more like a resonator than a lowpass filter. 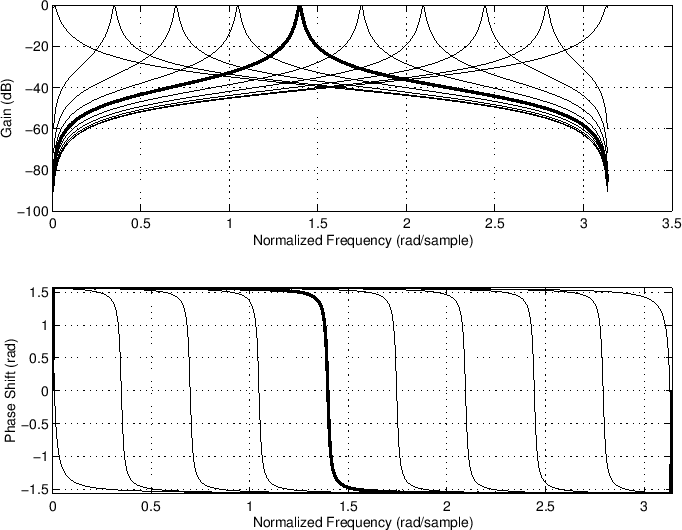 Various methods for digitizing the Moog VCF are described in . 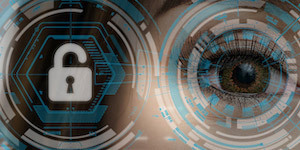 It turns out to be nontrivial to preserve all desirable properties of the analog filter (such as frequency response, order, and control structure), when translated to digital form by standard means.